All treated water systems have the potential to develop scale and other water-formed deposits. Even the condenser and chiller tubes in the cleanest systems require periodic brushing to remove bio-film and scale. Water-formed deposits can be a complex amalgam of organic material, entrained dirt and debris, corrosion products and scale-forming minerals. The concentrations within the matrix and the ratio of the component concentrations provide insight into whether the water treatment program is successfully controlling fouling and the formation of bio-films. Deposit samples obtained from different locations within a system each tell part of the story. 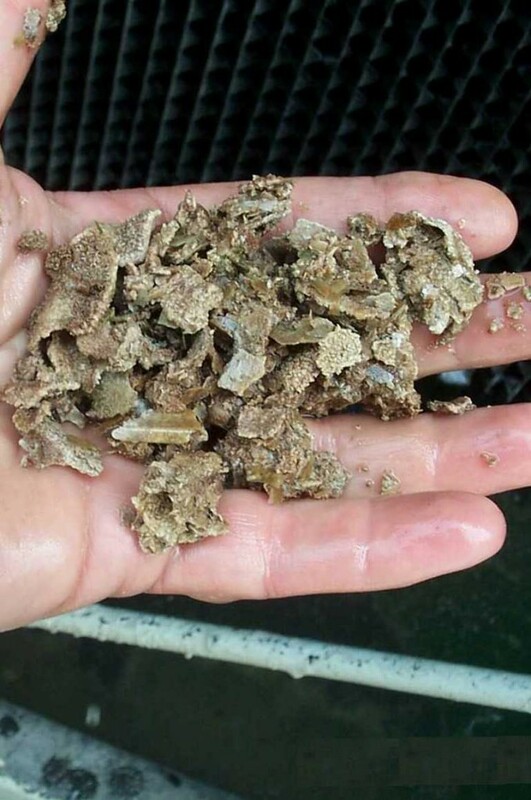 “Brushwater” and debris samples obtained when chiller tubes are punched will indicate whether the treatment program is successfully controlling scale and, more importantly, controlling the formation of bio-film. Cooling towers present a wide variety of conditions, including the wet deck, the basin and the fill. Deposits from these different locations will have different compositions, but, together, they can pinpoint problems with water treatment chemistry. AWTC has an in-depth knowledge of the deposit-forming potential of the various parts of treated water systems. With this knowledge, AWTC will obtain those deposit samples most likely to reveal useful information. AWTC has the experience to choose the appropriate analytical techniques (e.g., TEM, SEM, XRD, XRF and wet chemistry) and to interpret the results based on the existing water treatment program and the system operating parameters.